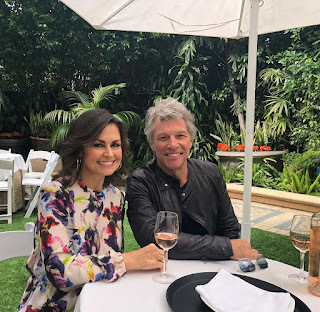 Lisa Wilkinson & Jon Bon Jovi. Ahead of Bon Jovi's upcoming Australian tour, Jon sat down for an interview with The Project's Lisa Wilkinson. Among other things, Jon discussed Richie Sambora, the band's Rock & Roll Hall of Fame induction, marriage, and the cult of celebrity. Watch the full JBJ interview on Ten Daily. MD: What’s your typical day on the road like? Tico: We usually fly after the show to the next city. Most days I go to the gym to run and stretch to keep my muscles in shape. For indoor shows we go to the venue at 5 p.m. to do soundcheck, and then we have dinner. And then we do a session with our sports guy to stretch and get our heads on track. The set changes every day, so it keeps it moving and fresh. I keep a small pad in my road case, and I run through patterns to warm up my arms and hands before the show. MD: What kind of warm-ups do you do? Tico: First I use a portable massager called the Thumper; it loosens up the fascia [connective muscular tissue] from the night before. Then, on a practice pad, I start out with very slow and deliberate motions to stretch the wrists and forearms, the slower the better, until I feel I have full motion and I’m warmed up enough to do singles, paradiddles, triplets, press rolls, etc. If there’s no pad, I like to use a cushion to do slow single-stroke rolls—again, very calculated. Read Tico's full interview on the Modern Drummer website. Are you going to any of the shows in Japan or Australia?